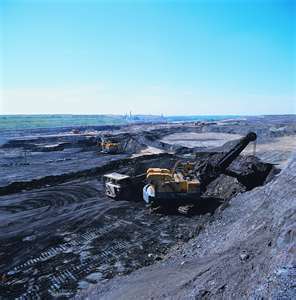 Tar sands' excavation in Alberta. The battle as to whether the construction of pipelines designed to run across the United States, from Alberta, Canada, is raging hot. No hint of prediction yet is in the offing that could tell if this oil infrastructure is bound to happen in the soonest possible time. Recently, the Obama administration has considered constructing the Keystone XL pipeline which would take Alberta's tar sands oil to Gulf coast refiners. But this plan was held in adyance for environmental reasons. However, TransCanada, Keystone's promoter is still hoping that the project will be approved, says May 26th issue of The Economist. As the battle rages on, the National Energy Board of Canada is in the process of conducting public hearings to make sure that the pipeline construction will be acceptable to both the governments and the environmentalists in Canada and the United States. The environmentalists' petitions came after Enbridge, an energy distributor, sought permission to reverse the flow of Line 9, a duct of 195 km (121 miles) which was designed to move imported oil westward to petro-chemical plants in Sarnia, Ontario. According to the Economist, What Enbridge wanted was to let the oil flow eastward, from Alberta and North Dakota to a refinery in Nanticoke, Ontario and to other Quebec refiners. It was at this stage when environmentalists filed their petitions against the impending switch. "They have expressed worry that if it is approved, Line 9 will soon start moving oil from the Alberta tar sands to Montreal and then, if the flow of another pipeline is reversed, to Portland, Maine for export." Right now, Canada's energy industry and its conservative government cannot pursue the projects' infrastructures because the local communities and the environmentalists have expressed opposition by asking the Canadian government to halt the development of the tar sands. Another thing that gives them so much concern would be the increase in the production of tar sands into a refined oil. It was estimated that oil production is expected to rise from 2 million to 3.3 million barrels a day by 2020, or from 58% to 72% of Canada's total oil output. The Economist said quoted a study from Pembina Institute, an environmental think-tank in Calgary: "Per barrel, the extraction of oil from bitumen emits between three to four times as much carbon and other greenhouse gases as conventional oil does. Approval of these projects is expected to be resolved within 18 months, wherein at least 40 federal departments and agencies are involved to thresh out the kinks that surround the delay in the approval of the pipelines. The bill has mandated that only those directly involved in the pipeline projects would be able to intervene in public hearings. Included in the budget bill was a provision that would launch an investigation as to whether environmental organizations are engaged in political activities that tend to run counter to the true objectives of enhancing energy developments in Canada.